A classic aromatic blend of sweet French dried herbs including lavender with other fragrant delicate herbs. There are many variations, and our blend adds lavender to give it a wonderful twist. 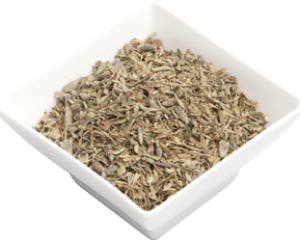 This mix of herbs is particularly used in French cuisine but also a good addition in any Mediterranean dish. It is excellent for rubbing on roasts or sprinkle on roasted vegetables. Herbs de Provence is a classic aromatic blend of sweet French dried herbs including lavender with other fragrant delicate herbs. There are many variations, and our blend adds lavender to give it a unique and wonderful twist. This mix of herbs is particularly used in French cuisine but also a good addition in any Mediterranean dish. It is excellent for rubbing on roasts or sprinkled on roasted vegetables. Made from imported and local ingredients including; marjoram, thyme, tarragon, basil, rosemary, fennel, lavender, bay leaves and sage.